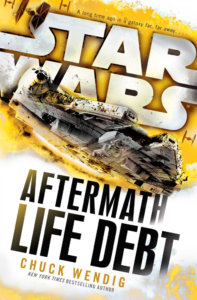 Time for our long-awaited review of the second book in Chuck Wendig’s Aftermath series, Life Debt! Next time, we’re going back to the Legends/EU timeline with the third and final book in A.C. Crispin’s Han Solo trilogy, Rebel Dawn. Thanks to Rick Moyer for our intro music and the Samurai Guitarist for our outtro! Rate The Star Wars Stacks on Stitcher and/or iTunes. Your stars and thumbs up help others discover the show. Please share a link with your friends too. « Episode 46 – John Jackson Miller Returns! The Star Wars Stacks is a Star Wars Expanded Universe Bookclub. Once a month, we get together to discuss a different novel from the Star Wars EU. Hosted by Chris (@cclemente74), Jen (@Jen_D_Rhodes) and Joe (@billybob476).